We’d love your help. 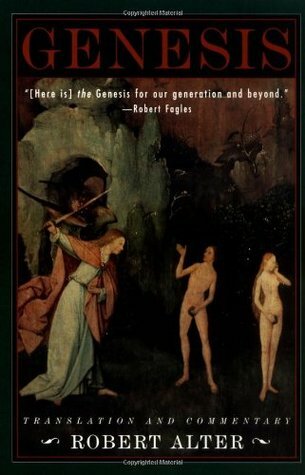 Let us know what’s wrong with this preview of Genesis by Robert Alter. Genesis begins with the making of heaven and earth and all life, and ends with the image of a mummy—Joseph's—in a coffin. In between come many of the primal stories in Western culture: Adam and Eve's expulsion from the garden of Eden, Cain's murder of Abel, Noah and the Flood, the destruction of Sodom and Gomorrah, Abraham's binding of Isaac, the covenant of God and Abraha Genesis begins with the making of heaven and earth and all life, and ends with the image of a mummy—Joseph's—in a coffin. In between come many of the primal stories in Western culture: Adam and Eve's expulsion from the garden of Eden, Cain's murder of Abel, Noah and the Flood, the destruction of Sodom and Gomorrah, Abraham's binding of Isaac, the covenant of God and Abraham, Isaac's blessing of Jacob in place of Esau, the saga of Joseph and his brothers. Although I am using this edition to write the review, I would strongly recommend reading a modern translation, not the beautiful but ornate, antiquated King James text. The best modern translation that I could find is the New International Version of the Bible. So why focus only on the book of Genesis? Because it holds such a high percentage of the well-known Biblical stories; because it is the beginning and sets up so much of the rest of the Judeo-Christian tradition; and because it is probably Although I am using this edition to write the review, I would strongly recommend reading a modern translation, not the beautiful but ornate, antiquated King James text. The best modern translation that I could find is the New International Version of the Bible. So why focus only on the book of Genesis? Because it holds such a high percentage of the well-known Biblical stories; because it is the beginning and sets up so much of the rest of the Judeo-Christian tradition; and because it is probably the easiest piece of scriptural literature for a reader to understand, sympathize with, and enjoy. The human nature on display in these stories is so recognizable; the psychology so modern. And the motivations are mixed, deeply mixed. Virtue and vice are not easily separated in the actions of the characters. Deception is often rewarded; violence is sometimes praised; justice is not necessarily equal. Survival, from the physical and human hardships, is highly regarded as an end in its own right. Some of the stories in the novella-length (86 pages in the NIV) book that have stayed with me include that of Lot's daughters, who, after the destruction of Sodom and Gomorrah and the termination of their mother, think they and their father, hiding together in the mountains, are the last people left on earth. So the daughters conclude they must seduce their father in order to keep the human race alive. How often does that one get read in church liturgy? Or the manner in which Jacob receives his father Isaac's crucial blessing, over his older (and thus by tradition more deserving) brother Esau. It is the legal key to inheritance and status, but it is also a cruel deathbed deception, connived in with his mother Rebekah. Or the amusing anecdote of how Rebekah complains that her in-laws, from Esau's marriage to a local Canaanite, are getting on her last nerve, making her life "not worth living." At the same time, Esau's desolation at having lost his father's blessing, as much from the emotional side as from the legal considerations, provokes great sympathy. Of course, there are the well-known episodes, like Jacob's dream of the stairway to heaven; Noah and the flood; and the lengthy saga of Joseph, sold into slavery by his older brothers, the sons of Jacob, only to rise in time to become Pharaoh's right-hand man. This became the genesis of Thomas Mann's tetralogy, Joseph and His Brothers, which has been re-translated in recent years in a highly praised edition. It is striking to read the opening pages of Genesis, of course, as it explains the origins of the universe. There are details in there, of the "formless, empty" Earth, the darkness, and later the separation of the "expanses," which seemed to me not only sophisticated, but quite compatible with at least some aspects of how scientists describe a "Big Bang" origination. Alter is perhaps the model scholar. He knows his subject utterly -- antiquity, language, literature, Judaism. The go-to guy. He examines Genesis from a literary perspective, in his footnotes, which background cultural and historical matters and go into the linguistic nuances that time to time must be aired. The translation he renders distinguishes poetic text from prose. He explains -- occasional footnotes provide -- a bit about the workings of Hebrew syntax and poetics as he formulates an Engli Alter is perhaps the model scholar. He knows his subject utterly -- antiquity, language, literature, Judaism. The go-to guy. He examines Genesis from a literary perspective, in his footnotes, which background cultural and historical matters and go into the linguistic nuances that time to time must be aired. The translation he renders distinguishes poetic text from prose. He explains -- occasional footnotes provide -- a bit about the workings of Hebrew syntax and poetics as he formulates an English easy for us to understand without losing the vibrations of the King James version. Disclaimer: I can't remember ever actually reading another translation of Genesis in whole so this is my first real experience with it. Firstly, reading through the introduction is an adventure and almost a necessity when reading this book. Alter gives a huge amount of insight into the world of translating religious texts. There, he gives an explanation as to why his translation is unlike most of the other translations (spoiler: its because he likes to translate things literally). However, his i Disclaimer: I can't remember ever actually reading another translation of Genesis in whole so this is my first real experience with it. Firstly, reading through the introduction is an adventure and almost a necessity when reading this book. Alter gives a huge amount of insight into the world of translating religious texts. There, he gives an explanation as to why his translation is unlike most of the other translations (spoiler: its because he likes to translate things literally). However, his insights don't stop there. I swear this book is more footnotes than actual text but that's perfectly fine and even what makes this book so amazing. It's wonderful to see the struggles Alter had when translating the text and he brings up many things that would not have come to my knowledge without them. They allowed me to read Genesis as a work of literature that can be appreciated for its own existence without context. While I'm not a religious person by any means, and this book did not convince me to change my beliefs, I do think that it was well written (well translated?) and I found the author's commentary fabulous. I would read more of his translations of the Bible, for certain. I read this book for an upcoming Humanities class, but would recommend it to others just for the stories (myths? legends?) involved. I attended a Catholic school from grades 5-12, and there was A LOT of things explained in the commentary that I never learned in my 8 years at a Catholic school. I'm not religious by any means but no doubt it's worth a read since a lot of novels reference back to the book of Genesis. For my Bible as Literature class we had to read this translation. I found the notes to be fantastic and very insightful to readers, such as I, who had very little prior knowledge about the Bible and its comments besides that it is a book of sorts. It was fascinating to read this translation of Genesis along side other, more traditional translations for my Bible as Literature course. I never thought of Genesis as witty before, as I've only come across the solemnity and grandeur of King James' Bible. Eye-opening. Changed the way I read the Pentateuch. Brilliant Hebrew scholar, and very accessible too. Beautiful... an honest attempt at achieving the poetry of the original Hebrew texts. Reading it like straight literature is beyond tolerable; dare I say it is enjoyable? This review has been hidden because it contains spoilers. To view it, click here. Interesting read. It's my introduction to reading religious text as an adult. Alter's footnotes are pretty valuable. They provide a lot of context about the translation from Hebrew, recurring themes, Judaic interpretation, geography, and period culture. I can't imagine reading any of this without that context, it really pulls it all together. Alex, I figure maybe you'll revisit this at some point. More specific comments on this book are in your email, subject "Hebrew Bible Notes". This is such a terrific translation - the language is lovely, but more importantly, the book is bolstered with absolutely marvelous footnotes that explain particular word choices, point out recurring themes or grammatical structures, and disuss some historical aspects (THE CAMELS!). A good translation for studying the Bible as literature. This, rather than the typical translations (e.g. King James,) captures the poetic intricacies of the Hebrew original through its extensive notes and commentary, if not the skillfully crafted translation itself. How can you argue with the Bible? The greatest story ever. And Robert Alter's translation brings in back to life. This rating is for Robert Alter'translation and commentary. Compelling translation, every page, every verse, even, full of insights. In my read-through of Genesis, I used two sources from Jewish scholars. The first was the Great Course on Genesis taught by Gary Rendsburg (http://www.thegreatcourses.com/course...). The syllabus for that course recommended this translation and commentary, which I had never heard of before. Robert Alter's translation ended up being an extremely pleasant surprise. First, the translation itself is beautiful to read. He explains at length in his introduction that he sought to stay as close as possib In my read-through of Genesis, I used two sources from Jewish scholars. The first was the Great Course on Genesis taught by Gary Rendsburg (http://www.thegreatcourses.com/course...). The syllabus for that course recommended this translation and commentary, which I had never heard of before. Robert Alter's translation ended up being an extremely pleasant surprise. First, the translation itself is beautiful to read. He explains at length in his introduction that he sought to stay as close as possible to the original literal meaning while retaining the rhythm and feel of Biblical Hebrew. I've never read Hebrew, so can't say whether he succeeded, but there's something about the text that I really enjoyed. The commentary is almost completely non-theological, and frequently focuses on interesting linguistic observations. He often explains puns or wordplay from the original Hebrew that do not carry over to the English. Where there were particularly obscure words that he wasn't sure how to translate, he discusses the approach other translators have taken and explains his choices. The result was a view on Genesis that I did not get from any of the other sources I reviewed, and I immediately ordered his translation of the rest of the Pentateuch. Rereading this for my chronological reading of the Bible. So very good! I read this a bit every day and was blown away by Alter's translation and notes. HIGHLY recommended thus far. Reading both for morning reflection and prayer AND as prep for eventually reading Genesis on my podcast, with commentary from various sources, one of which will be this book. No translation and commentary I have read has so vividly brought alive this scripture. The commentary is cultural and literary rather t Rereading this for my chronological reading of the Bible. So very good! I read this a bit every day and was blown away by Alter's translation and notes. HIGHLY recommended thus far. Reading both for morning reflection and prayer AND as prep for eventually reading Genesis on my podcast, with commentary from various sources, one of which will be this book. No translation and commentary I have read has so vividly brought alive this scripture. The commentary is cultural and literary rather than religious, just fyi, but that simply enhances it for the reader who already has a religious grounding. I am now reading this, with the permission of Robert Alter and his agent, on my podcast so ... technically that means I'm rereading it. Especially since reading a book aloud often gives me a deeper perspective. Robert Alter is one of my new favorite writers. His knowledge of old testament commentary is centuries-deep; he cites medieval scholars in his own commentaries, and shows how the choices modern translators have made impact the way we understand the Genesis stories, and shines light on the uniquely Hebrew ways of telling stories through repetition and slight variations that reveal the state of mind of the speaker. I have never paid such close attention to Bible stories before. I have the same fee Robert Alter is one of my new favorite writers. His knowledge of old testament commentary is centuries-deep; he cites medieval scholars in his own commentaries, and shows how the choices modern translators have made impact the way we understand the Genesis stories, and shines light on the uniquely Hebrew ways of telling stories through repetition and slight variations that reveal the state of mind of the speaker. I have never paid such close attention to Bible stories before. I have the same feeling about this translation as I felt the first time I read Shakespeare and finally got past the strange-sounding language: wow... there's so much more going on here than I realized. Although I didn't fall in love with this commentary when I first picked it up, I grew to appreciate it more and more as I read it. This commentary offers subtle nuances into the Hebrew that helps to pull out the rhythm, peotry, and playfulness of the author of genesis. Alter shows what is happening in the text with very helpful insights that I will be able to pull out for my preaching. I will use other commentaries as well but I believe that the Hebrew nuances as depicted in this book will be qu Although I didn't fall in love with this commentary when I first picked it up, I grew to appreciate it more and more as I read it. I will use other commentaries as well but I believe that the Hebrew nuances as depicted in this book will be quite valuable. Looks good so far. I am only up to chapter three, and I compulsively read footnotes which is not the fast way to read this one. The author has gone on to translate all five books of Moses into English. His painstaking approach is to try to capture the nuances of the original Hebrew. The footnotes explain some of the translation problems such as obscure phrases and double meanings implied in the text. Alter's Genesis was good and provided solid textual insights, but I expected more from it after reading what his introduction claimed and the praise it received. His translation was terse and beautiful, but still seemed fairly familiar (to this reader of the KJV). Maybe if, like Heaney's translation of Beowulf, I heard him read it aloud, it would make a difference. Probably not, as I'm fairly sure Alter does not have a cool Irish accent. Alter (by reputation) does a brilliant job of translating the Hebrew text and a brilliant job (this, I know) of exploring the literary traits and richness of the book of Genesis. I only fault the translation in that it was produced by one man, not a committee that could broaden Alter's single perspective. That fault, if it be one, hardly matters, for the book offers many pleasures and insights into the first book of the Bible with a commentary geared to the interests of today. A piece that serves as the foundation for countless books, movies and stories; as well as what is possibly the most well put together insight into psychology and people coping with the world today. Regardless of whether you are not a Christian, Muslim or Jew, this is a work you should definitely consider reading soon, especially if you have an interest in literature or psychology. As it says on the cover, quoting Robert Fagles, "[Here is:] THE Genesis for our generation and beyond." Agreed, and dare I say the definitive translation... his insights and 'asides' are hugely informative and faith-formative. A solid basis to any reading of Genesis. Highly Recommended. “Take care to keep open house : Because in this way some have had angels as their guests, without being conscious of it ".